At the beginning on November Birchbox Instagrammed a picture of this months box (technically there's two, more about this shortly) and I was so excited by it I regrammed the picture to my own Instagram. 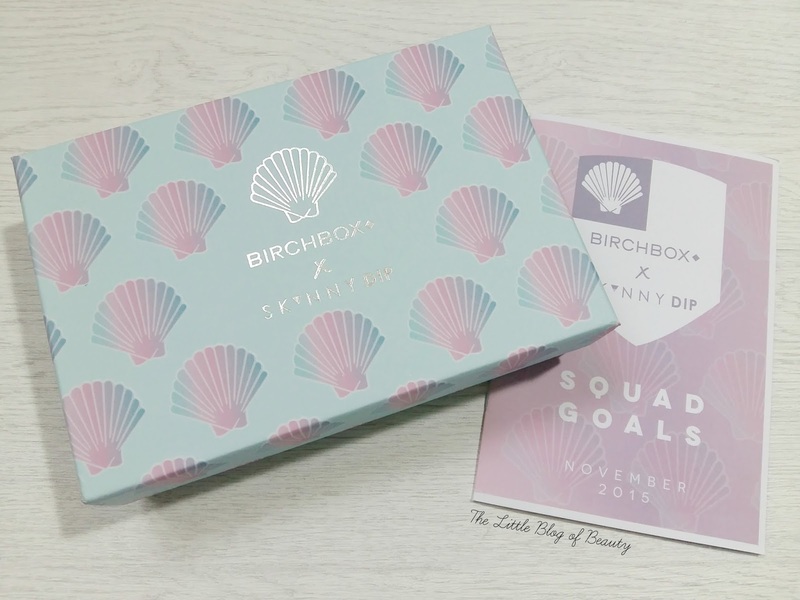 In case you haven't seen it yet this months box features a collaboration with quirky accessories brand Skinnydip and to celebrate the box has had a very Skinnydip style mermaid esq makeover. There are two boxes available, a pale blue one and a darker blue/purple one, and both feature the same seashell design and updated Birchbox x Skinnydip logo. There is no pick your box this month though, you have no choice over which one you receive. I had my fingers crossed for the darker box but actually got the lighter one. Although I'm a little disappointed it's still a very pretty box I'm pleased to have. As you may be aware I don't currently subscribe to any beauty subscription boxes but order boxes one off if I love the look of the contents. As much as I loved the look of the box itself I don't order them based on the boxes alone, I always wait to see what the contents are, but as soon as I saw the contents of the November box I'd ordered it quicker than you can say Birchbox! Although #SquadGoals is probably THE hip term of the moment and I can see why they've used it I have to admit I do find the term a little cringy (it's probably my age, I also hate bae!). It does accurately describe what is a very good round-up of brands/products though. Lets start off with the disappointing sample. I've mentioned before that I don't believe there's a place in beauty boxes for tiny perfume samples you can pick up for free in department stores, so I was disappointed to see the English Laundry sample. The saving grace is that this is actually a 'beauty extra' rather than one of my samples. The perfume smells nice enough but it's not really my kind of thing. The first sample is a Cowshed Cow pat hand cream (worth £8), which is the only full size product in my box this time. In the last few years I've gone from not using hand cream at all to becoming pretty dependent on it, so a new hand cream to try is always welcome (even if it is called Cow pat!). Unfortunately this isn't one I can use as it contains lavender, but as my mums default when she runs out of hand cream now is to come to me to check my stash, this will be going to her. One of the products I really wanted to see lurking in my little drawstring bag was the Living proof Restore instant repair cream (30ml worth around £6). I'm currently trying a Living proof product that I don't think is working for me personally, but I'm definitely curious to try more of their products. Their products are quite expensive (this one is £25 full size) so it's nice to have a sample size to try before committing to an expensive full size product you might not like. I don't suffer from split ends at all since I started dying my hair, but after everything my hair has been through recently I do have some breakage I'd like to attend to. I have a few of Lord & Berry's lipstick crayons and I love them. So when I saw a Lord & Berry product was included, even though I didn't know what it was, I wanted it. This is the Lord & Berry Silhouette neutral lip liner which is a translucent liner. I believe this is a sample size and the full size is worth £8.50/£9. I already have a liner like this from The Body Shop but I prefer this one because you can sharpen it (even though you can't actually see it!). The idea is you apply this around the edge of your lip line and it's completely invisible (so can work with any lip colour) but stops your lipstick bleeding. A product I think any lipstick lover should have. I've only tried a few REN products but have loved the ones I've tried, so I was happy to see the REN Wake wonderful night-time facial (10ml sample size worth £8), which I haven't tried before. I don't know much about this product other than that you pop it on before bed and wake up looking gorgeous (hopefully) so I'm looking forward to slapping some of this on. The final sample is a little pot of Trilogy Make-up be gone cleansing balm (10ml sample size worth around £2.50). I usually prefer cleansing oils rather than balms but I've seen this popping up on a few blogs recently and it comes highly recommended so I'll see how I go. Off the top of my head I don't think I've tried a Trilogy product before so this will be my introduction to the brand. There are also two additional perks of the Skinnydip collaboration. The first is that if you're a new subscriber you can upgrade your box to include a Skinnydip phone case (with iPhone and Samsung S series versions available) for the reduced price of £4 rather than £12. The second is that on the back of the Birchbox booklet in your box you'll find a code for £10 off an order off at least £24 from the Skinnydip website. Including the box, the contents and the offers available I think the November Birchbox is pretty amazing and I'm really glad I decided to order it. You can sign up for a Birchbox subscription on the Birchbox website. What do you think of the November Skinnydip collaboration box?